Two people are behind bars after a weekend robbery turns into a knife fight. HUNTSVILLE, Ala.-- Two people are behind bars after a weekend robbery turned into a knife fight. Video released by police in Huntsville, Alabama shows a knife wielding man attempting to rob a convenience store early Saturday morning. When the clerk pulls out a large machete and remotely locks the store's door, the armed suspect throws something through the store's glass door to escape. Both the clerk and robbery suspect run outside to a waiting car. That's when video shows a second female suspect pulling out a knife and chasing after the clerk. 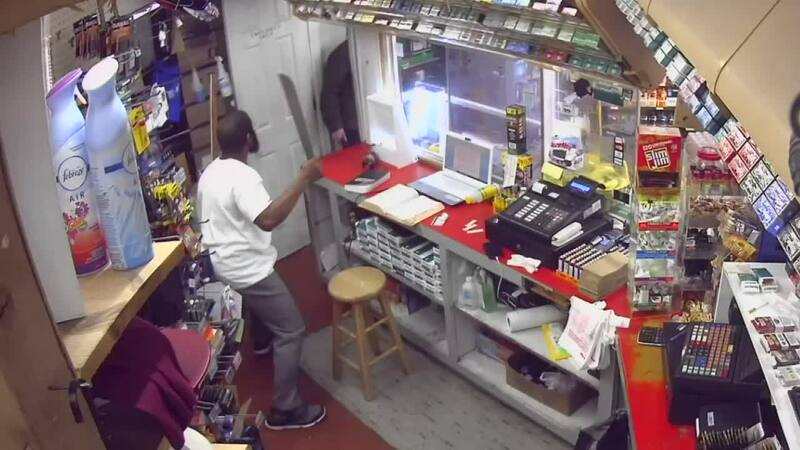 During the altercation the clerk starts beating on the suspects' vehicle with the machete. He says he wanted to leave enough marks on the vehicle so police could easily find it. And they did. The two suspects were arrested and charged with robbery a few blocks away.